Ten pretenders have been separated from the two remaining contenders in the NFL playoffs. Of the 10 playoff games, only two have been remotely competitive. The two exceptions came during divisional-round action before Sunday's festivities produced another pair of snoozers. Both the AFC and NFC title games resulted in beatdowns by the home teams, with the New England Patriots and Atlanta Falcons rolling into Super Bowl LI. Thus two legendary franchises-the Pittsburgh Steelers and Green Bay Packers-were sent packing. Green Bay Packers . 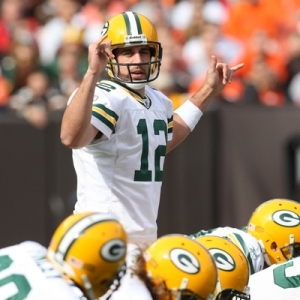 No team quarterbacked by Aaron Rodgers is ever really out of any game. But the Packers were also never really in the NFC Championship. Right from the start, Green Bay seemed like it was out of gas both physically and mentally after the previous week's epic win at Dallas. A pair of first-quarter miscues (Mason Crosby missed a 41-yard field goal and Aaron Ripkowski fumbled at the Falcons' 11-yard line) put the Pack in 10-0 hole after one quarter on the way to a 24-0 halftime deficit. Rodgers and company never mounted any real charge before losing 44-21. Atlanta is a +3 underdog against New England in Super Bowl LI. Le'Veon Bell . That is not exactly what Bell had in mind for Pittsburgh's visit to Foxboro this past Sunday. Not only did the Steelers get blown out 36-17, but Bell also left in the first quarter with a groin injury. He rushed only six times for 20 yards before exiting. DeAngleo Williams took over primary ball-carrying duties and scored one touchdown but gained just 34 yards on 14 attempts. Adding insult to literal injury, Pitt's defense gave up 431 yards of offense to New England. The "over/under" for Super Bowl LI is 58.5 . Chris Paul . The Clippers' point guard underwent thumb surgery last Wednesday and will be sidelined for 6-8 weeks. Paul sustained the injury during a win over Oklahoma City two days before going under the knife. X-rays were negative, but an MRI revealed ligament damage. Paul is averaging 17.5 points, 9.7 assists, and 5.3 rebounds per game this season. Los Angeles had won seven in a row before Paulwent down but have since lost two straight without his services. Head coach Doc Rivers' squad is now tied for fourth in the Western Conference with Utah and 29-16. The Clippers are +7 underdogs at Atlanta on Monday . Boston Bruins . Boston suddenly finds itself two points away from being out of a playoff spot in the Eastern Conference. The Bruins are in the midst of a four-game losing streak and own just a single point during this stretch, having forced overtime only against Detroit last Wednesday. They have been shut out twice in their last four outings and scored only one goal its other regulation setback, a 5-1 decision against Pittsburgh on Sunday. Boston lit the lamp five times at the Red Wings' expense but allowed six goals. The team is now tied for seventh in the East with Philadelphia, one point ahead of Toronto. It is +1600 to reach the Stanley Cup Finals. UCLA . The Bruins were 19-1 heading into this past Saturday's date with Arizona, with their only setback having come on the road at then-No. 24 Oregon via a Ducks' three-pointer just prior to the buzzer. So there was no reason to think a home game against the Wildcats would be particularly complicated. Despite playing in the friendly confines of Pauley Pavilion, which was hosting a matchup between Top-20 teams for the first time in nine years, UCLA suffered a 96-85 setback. Arizona shot 50 percent from the floor, 45 percent from 3-point range, and 90.5 percent from the foul line in its offensive clinic. The Bruins are +700 to win the National Championship. Andy Murray . It was all right there for Murray to win the Australian Open for the first time in his career. Murray is a five-time runner-up of the tournament, and Novak Djokovic is responsible for four of the Scot's five losses in finals. Djokovic, a six-time champion in Melbourne, crashed out of the event with a five-set setback against Denis Istomin in the second round. Thus the door was open for Murray, but he soon fell victim to another shocker. The world No. 1 lost to Mischa Zverev 7-5, 5-7, 6-2, 6-4 during fourth-round action on Sunday afternoon. Roger Federer will now face Zverev instead of Murray in the quarterfinals on Tuesday. Federer is a +250 favorite to win his 18th Grand Slam title. Simona Halep . It did not even take more than one full round for the women's Australian Open draw to witness its first huge upset. In fact, that got started in the first match on the first day. Halep, the No. 4 seed, won all of four games in a 6-3, 6-1 blowout loss to American underdog Shelby Rogers.Since finishing runner-up at the French Open and reaching the Wimbledon semifinals in 2014, the Romanian has been past the quarters of a slam only once. World No. 1 Angelique Kerber and No. 3 Agnieszka Radwanska are also out of the Aussie Open. Serena Williams is a +175 favorite to lift the winner's trophy.